Over the years, Tom Roberts’ room boxes have proven to be some of the most interesting and awe-inspiring pieces in the collection. People are drawn to his eclectic style and unexpected pairings, his impeccable detail and, in many cases, his sense of humor. His scenes are perfectly overcrowded—a delight at every turn offering a childlike feeling of exploring your grandmother’s attic for the first time. True to form, that is the case with G. Roberts & Son, a three-story structure depicting an import store on the front bottom level with living quarters behind and above. 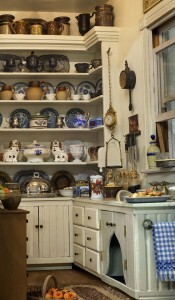 Tom made it with his father, Guy, who also made many of the furnishings. 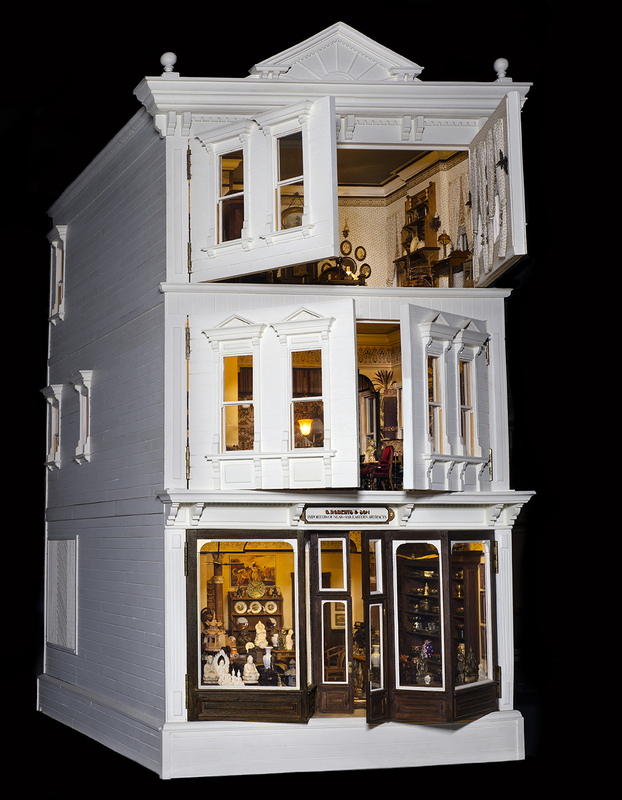 It was the second and last house created by the pair, with Tom turning his focus to room boxes, explaining the larger structures were too difficult to take to shows or to even display properly at home. While you may recognize some makers’ pieces in the 1/12-scale building, I unfortunately do not have information on any of the items. Tom apologizes, too, saying, “When I embarked on this wonderful hobby some sixty-plus years ago, I never for a moment envisioned it evolving into the large undertaking it has become. As a result of my lack of foresight, I never kept records of who made what, when, the cost, etc. … out of fear of an incorrect attribution, I won’t attempt to name names.” Apology accepted, Tom. 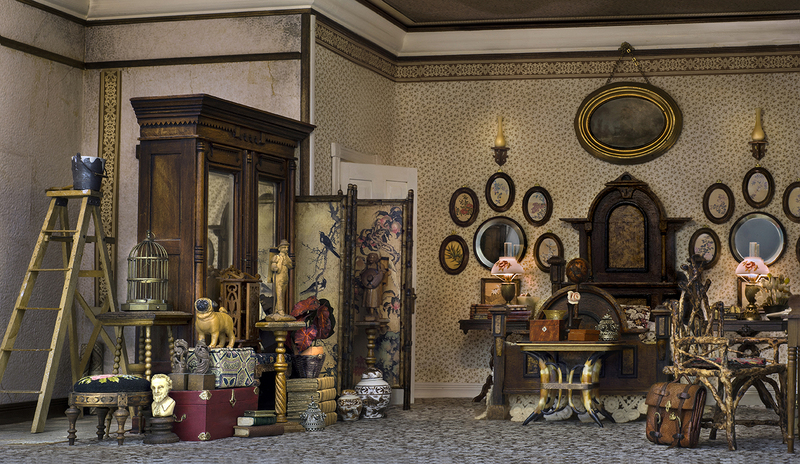 As we peek inside each room, we’ll explore it collectively as a piece of your imagination and as a tribute to all artisans whose work you fused to create a marvelous sense of a lived-in and much-loved space. 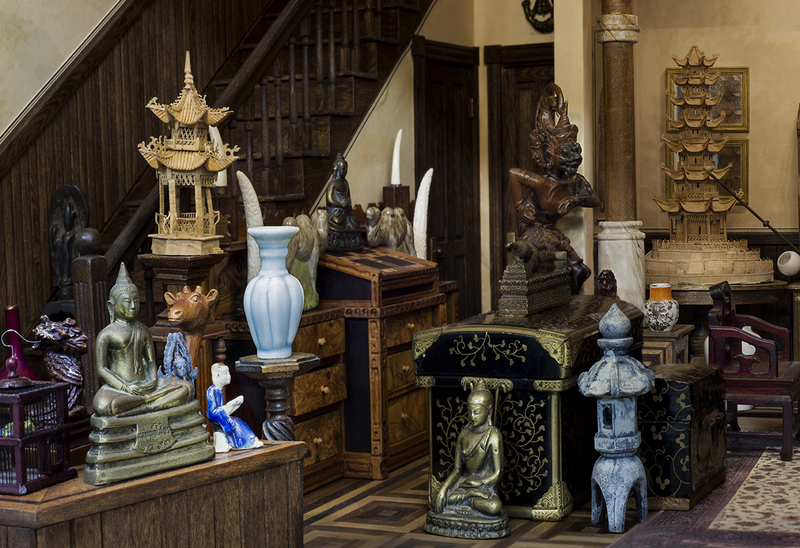 Tom created G. Roberts & Son with the idea it would be a gallery for Asian art and artifacts because he had a sizable collection of Far East-themed works in all types of media—woods, bronzes, porcelains and black and gold lacquerware. 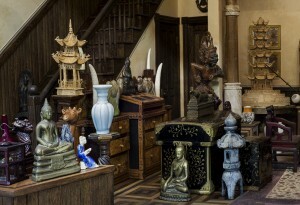 I can only imagine strolling upon a real life shop like this on an off-the-beaten-path street of a busy city. I would have most certainly entered. The living and dining areas directly above the shop (pictured below) are just as aesthetically diverse. Tom designed the various wallpapers (he once worked as a wallpaper designer) and printed them on brown and cream stock which added an aged feel. He then hand painted parts of the wall covering for a multi-color effect. 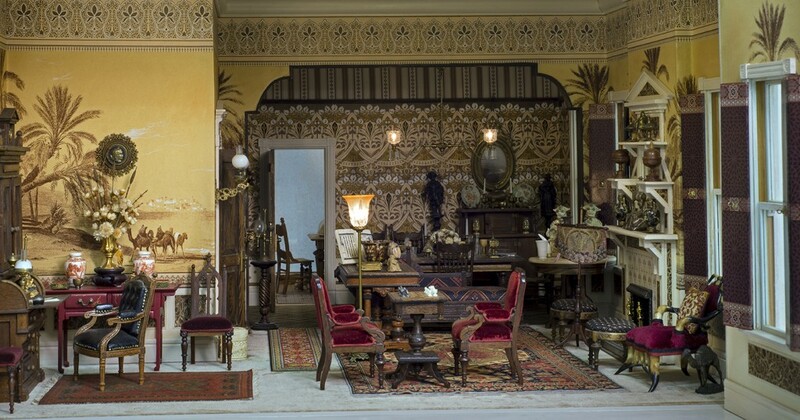 He crafted the wallpaper in the living room which features camels (“not very Asian, but fairly exotic,” admits Tom) by reproducing brown-line prints from old engravings. You can see a close-up here. On the third level facing the front is the master bedroom (below), which Tom presents as if it were being refurbished. Everything is pulled away from the walls so new wallpaper can be hung. I particularly like the wall by the ladder where you can see the outline of where an old picture frame once hung. 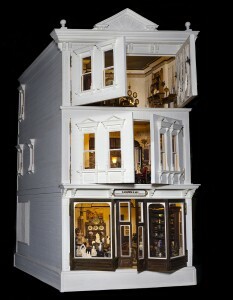 The backside of the structure opens to a small porch and a workshop on the bottom showing a dollhouse being built. The shot of the room pictured with a one-inch wide paintbrush for scale was a big hit on social media. If you missed it, it’s here. 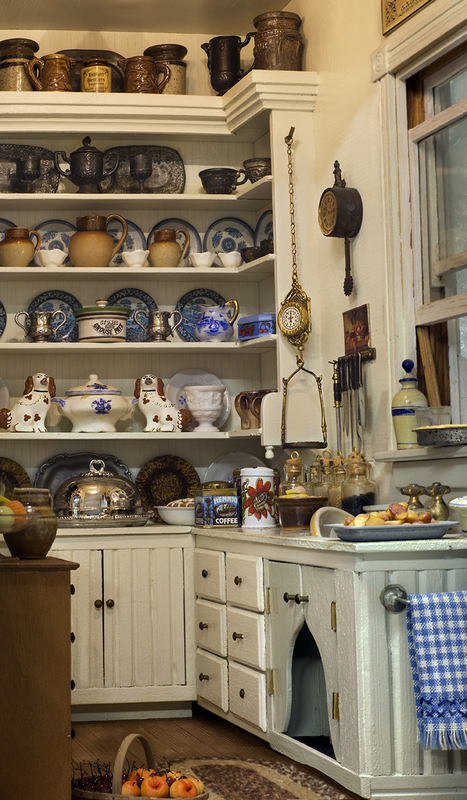 On the second floor in the back are two of Tom’s favorite areas—the kitchen and pantry. 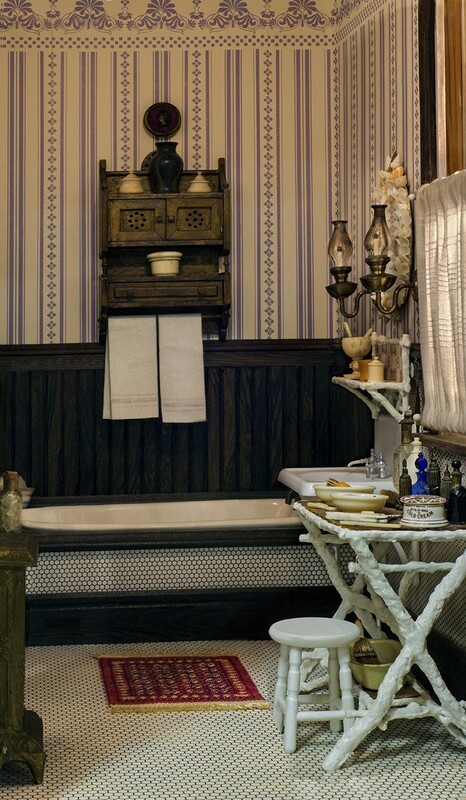 I can’t help but think they’re favored by him because he embellished the rooms with items from a dollhouse his mother had as a girl. 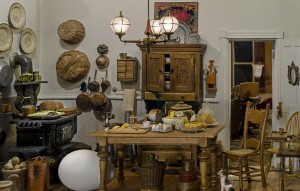 He also included many French pieces, for which he is known to be quite fond. The guest bedroom on the third floor was inspired by the rug, says Tom. In addition to the wallpaper, he made the twig chair, which matches the twig table in the bath—the only furniture he made for the structure. 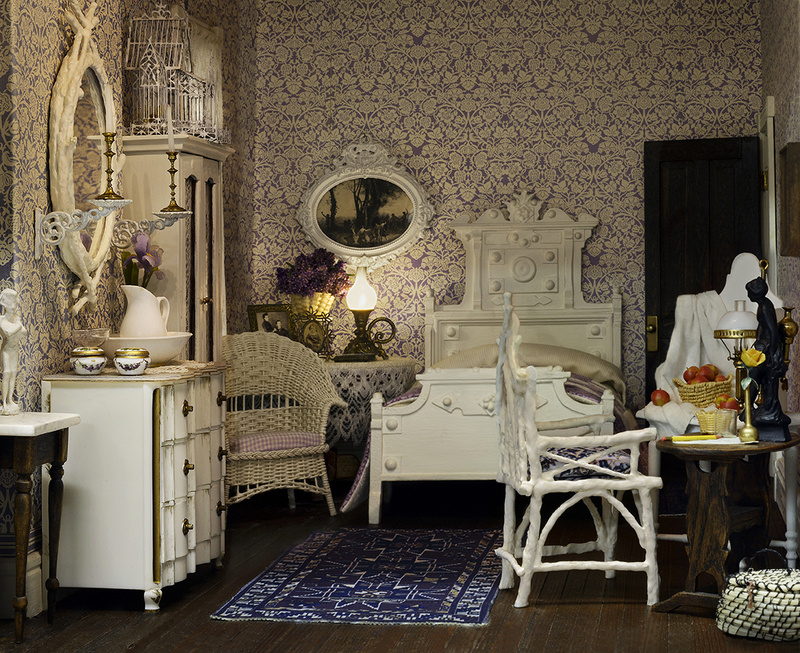 While this room has a shabby chic type of appeal, it actually dates before that design trend became popular in the States during the late ’80s and early ’90s. If Tom knew that decorator Rachel Ashwell was about to coin the phrase and bring the basically British style into department stores nationwide, he may have reconsidered. 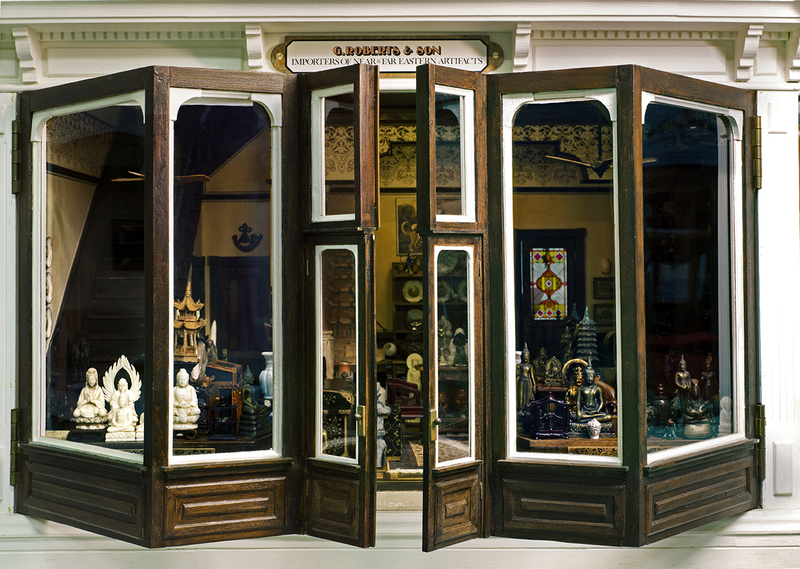 G. Roberts & Son will make its debut in October in our newest exhibition Scaled to Perfection: A Gallery of New Miniatures. 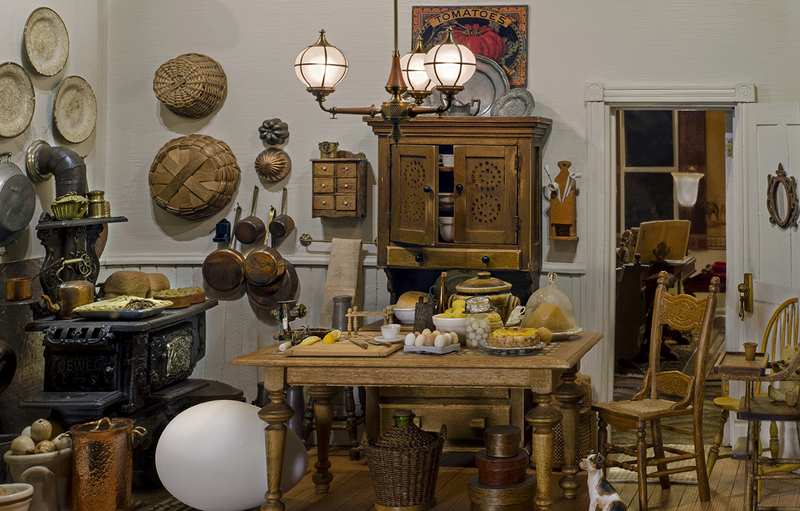 I’m sure visitors will walk away from this extraordinary piece feeling much like they would feel having just explored grandma’s attic—that they must return soon because there is so much more to discover.